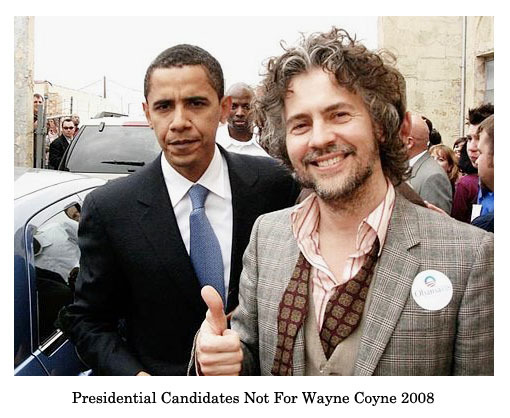 Seeing this lolphoto on Superpoop (MTS sister site), I was prompted to Google Wayne Coyne. Do this: Go to Google.com and type "wayne coyne" (don't hit enter) and look at the top search suggestion in the dropdown. Ironically, the dropdown has different suggestions for Jim Morrison, Keith Richards, Lou Reed, and even Steven Drozd, a Lips member whose heroin habits almost killed him. Conversely, it's been 20 years since Wayne's last psychedelic experience. In all fairness, the one for "Steven Drozd" is "steven drozd heroin."